KRESSO Krs-302 Flat Iron flat iron bills itself a "conditioning straightening iron" for its "Cushion" plates with Nano-Ionic minerals - designed to plump and recondition hair (not flatten) by retaining maximum natural oils and moisture, with "Fluoro-Ionic Coasting" to help plates glide through hair without catches or snags. 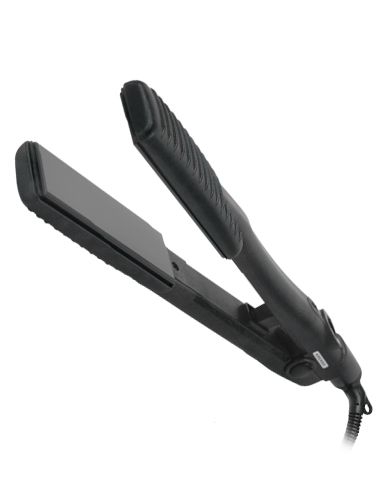 This fast hair straightener is ideal for retexturizing, permanent straightening and styling. The professional's tool of choice! Description: Damp-Dry to Dry Black. Tourmaline generates up to 6 times more negative ions upon heating that traditional ceramic ions. The extra negative ions along with gentle far-infrared heat guarantee soft, smooth, frizz-free silky straight hair without heat demage.